Anthony Ranaudo entered last season as arguably the top pitching prospect in the system, but struggled with command issues and injuries. By season's end, the 2010 supplemental first-round pick had thrown just 37 2/3 innings in Portland, and there were more questions than answers about what to expect from him this season and beyond. Last Saturday, Ranaudo got the start at the Minnesota Twins spring training complex in the Double-A game. Early reports from spring training indicated that Ranaudo’s stuff looked much improved from last season, but I was looking forward to finding out for myself. The conditions weren’t ideal as the ball was flying out due to heavy wind gusts, but Ranaudo ended up going four-plus innings and was very impressive, despite the final results looking a bit ugly. 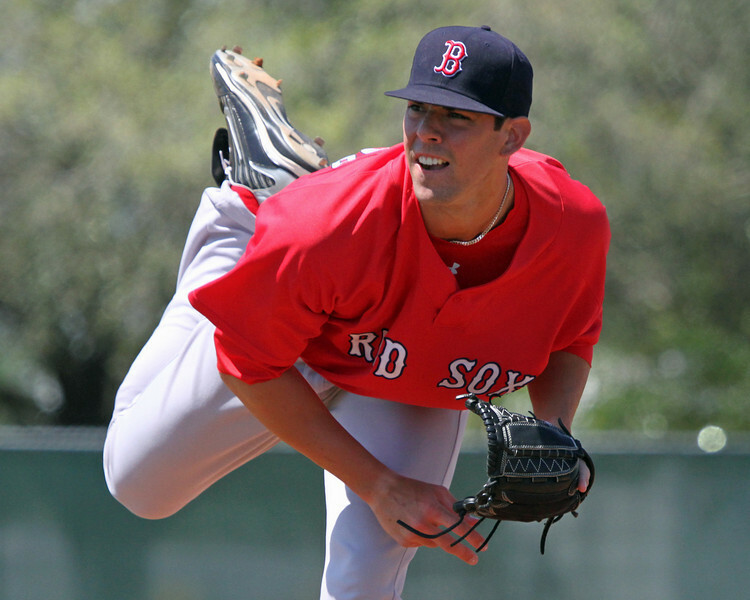 Ranaudo has an ideal pitcher’s frame at 6-foot-7, but his mechanics are inconsistent. He has a lot of moving parts in his delivery as a result of his height, and he struggled to find his release point in the outing. When he got locked into his arm slot in the third and fourth innings, however, he started to cruise and easily overpowered hitters. Ranaudo’s fastball velocity fluctuated greatly last year, sitting in the high-80s in some outings. However, on this occasion Ranaudo had his normal velocity, sitting 92-94 mph throughout the outing. He reached back to hit 95 mph on one occasion in the second inning, getting a strikeout on perfectly located pitch on the outside corner. Struggles with command and balance plagued him in the first inning as his arm slot fluctuated and he was consistently slipping on his landing foot. He gave up only two hits off his fastball, but one was a wind-aided grand slam that he left up in the zone. Other than that, he overpowered Twins hitters with the pitch, recording nine swing-and-misses. The pitch showed heavy arm-side run, especially when it was located down in the zone. In the second inning, Ranaudo struggled somewhat with control, missing up consistently. In the third and fourth innings, however, Ranaudo was locked in with his arm slot and release point, and showed excellent command. He located the fastball on both corners and up and down in the strike zone at will, and the Twins hitters had no chance. In these two innings, he recorded five strikeouts, four on fastballs, including striking out the side in the fourth on three heaters up in the zone. Ranaudo mixed in his curveball and changeup to complement the fastball. His curveball was the better of the two secondary pitches, showing as a plus offering at times during the outing. He clearly has confidence in the pitch, demonstrating a willingness to throw it in any count. The pitch is a true hammer curveball, which comes to the plate at 77-83 mph and has tight break when he doesn’t release it late. He gave up two hits off the curve, one of which came on a well-located pitch that the hitter was able to muscle to right field. He got one strikeout on the pitch and two other swing-and-misses, all three times when he buried it down in the zone. Ranaudo’s changeup isn’t as advanced as his curveball, but he showed some feel for it and it has the potential to be average-to-better. The pitch comes from the same arm slot as his fastball, but he struggled to locate it down in the zone during this start. When he leaves the pitch up in the zone, it is flat and very hittable. He got away with the missed location on one occasion, getting a deep fly out to center field, but another time he gave up a double. When he did locate the pitch down in the zone, it showed some drop and fade. His best changeup of the day came in the fourth inning when he threw one that faded away from a left-handed batter with the count at 2-1. While Ranaudo looks to be healthy and on the right track heading into the year, he was still inconsistent with his command and delivery, and has plenty of work left to do. Likely to start in Portland for a second time, he is one of the more interesting prospects in the system and I am looking forward to scouting him there to see if the stuff he showed in Saturday’s spring outing carries over into the season.